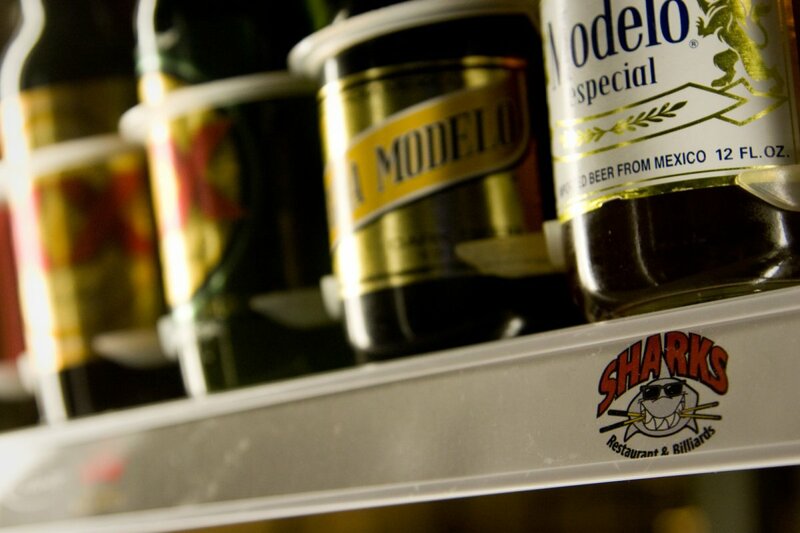 Sharks is much more than just a restaurant and bar. We are your adult fun zone. With tons of gaming fun such as Pool, Foosball, Darts, Giant Jenga, Bags and Bar Olympics you can not help but to be entertained. We also have plenty of tvs to watch your favorite sport teams. Come Play! 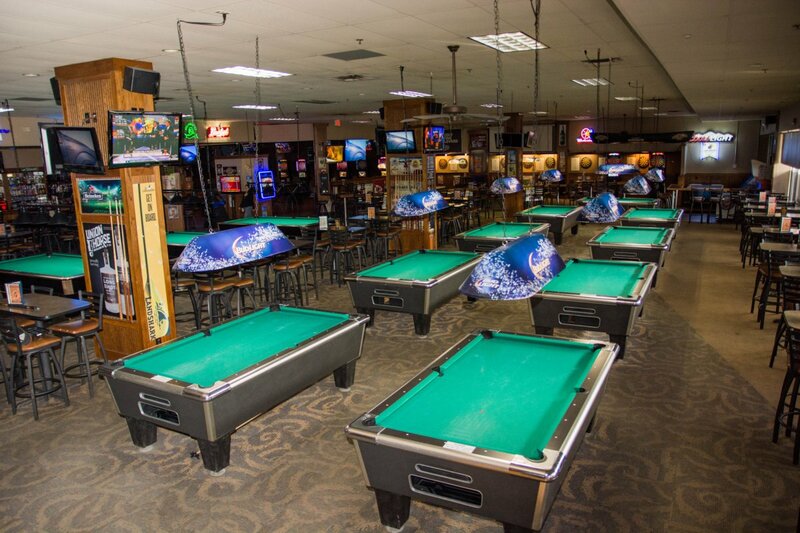 Whether you just want to kick back with some friends and play a casual game of pool or if you want to get more competitive; we are the environment for bit of both. All of the tables can be rented daily by hour for $7.00 an hour. Our 7 foot tables can also be played per game for $1. Wednesdays and Thursdays if you are looking for casual play most of our tables are available during the day from 11 to 5 and after leagues are over at 10:30. One big daily perk is that we offer Free Pool Daily from 11-5 with a $5 food/beverage purchase. -New BCA Leagues are starting the first week of January. Contact Gary Kluck @ (816) 520-0885 for BCA league information and to join. 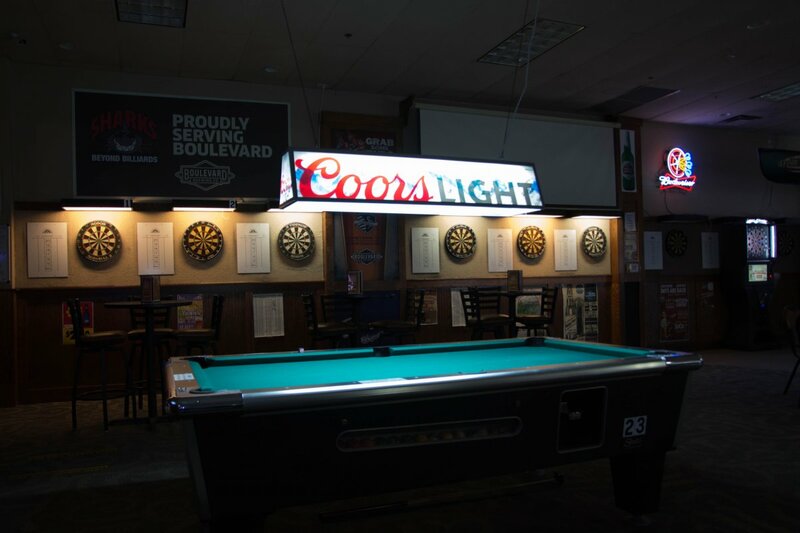 Whether you're a casual dart player or a league player, we have it all for you at Sharks! 11 Arachnid G3 dart boards, that you can play live online against other darters all around the world. Most of our dart leagues are played online and run 7 days a week. We try to schedule at least 1 soft tip tournament every month. For steel tip enthusiasts we offer league play on Wednesday night or a travelling league on Thursday night. Check out our event calendar for upcoming events. E-mail us @ info@sharkskc.com for league connections. BREAKING NEWS! WE JUST BOUGHT 13 BIGGER TV's! Two big projector screen tvs, two high definition 75 inch tvs, in addition, over 40 more high definition tvs surround Sharks space. This makes us the perfect hub to watch your favorite team. Come in for college basketball, football, NFL and MLB games. Overhead sound is an option and is projected during KU Basketball, Royals and Chiefs games. For more sound options submit a request. For large watch parties call and speak to a manager @ (913) 268-4006 and reserve a space for FREE! We have three foosball tables. Every week, on Thursday nights, we have an in-house open blind draw tournament. Play starts at 8:00 with a $5.00 entry fee. Sharks matches half of the pot. Some of the best foos ballers around the city participate in this weekly tournament. We have four house jenga sets come in and play for free. Ask your server for set up details and about tournaments. We have four house bag sets come in and play for free. Currently we have racing. Come in and give it your best shot. Come get your tee on and enjoy a game of Golden Tee. Located conveniently close to the bar. Contact us to sign up for Tournaments, League information and more.